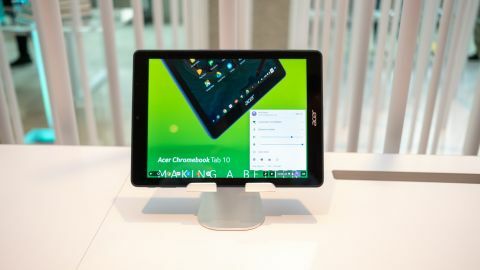 Acer has at last allowed the press to play around with the world’s first Chrome OS tablet, the Chromebook Tab 10. However, we’re not exactly psyched to have had the chance. You see, Chrome OS on tablets is a tricky proposition at the moment, with very little consideration in the interface for touch-only devices. That makes the otherwise cleverly-designed tablet rather difficult to use and difficult to get excited about. Acer may have beaten Apple to the punch with a tablet for classrooms (by a day) with an education tablet that includes a stylus, but perhaps it would have been better off pumping the brakes for a little while. Acer has priced the Chromebook Tab 10 rather conservatively at just $329 (about £229, AU$429), which includes the built-in stylus. That price gets you a 2GHz Rockchip processor behind the 9.7-inch, IPS touchscreen with a 2,048 x 1,536 resolution. Backing that up are 4GB of memory and 32GB of eMMC storage. Of course, that price is strategically set to combat Apple in the classroom and elsewhere in kids’ lives – but we’re not sure it’s enough. Apple’s iPad processor should handily trounce the Rockchip in performance tests, and it generally feels like a more substantial device. The Chromebook Tab 10 is designed like most budget Android tablets, with a blue, pocked plastic shell surrounding a display with rather thick bezels. Acer has included a USB-C port for charging and data transfer as well as display extending, as well as a microSD slot and headphone jack, which is more than Apple can say at least. Furthermore, Acer can proudly say that its education tablet stylus is included – it hides within the left side of the device – whereas Apple’s costs another hundred bucks or quid. However, it’s a rather chintzy-feeling pen with no additional features or buttons, despite the Wacom technology inside. That said, the stylus performs admirably, even including strong pressure sensitivity to create thin or thick digital ink strokes. We appreciate the light weight and no-nonsense style of the Chromebook Tab 10 design, but it’s just nowhere near as luxury-feeling as a device that costs exactly the same (though without the stylus). The display, on the other hand, is just gorgeous. It unsurprisingly matches Apple’s resolution pixel for pixel, but the IPS technology inside makes for awfully wide viewing angles. Perhaps our biggest bugbears with the Chromebook Tab 10 come through its interface. Simply put, Chrome OS needs work in a tablet environment – at least for those without keyboards. Chrome OS on tablets makes very few considerations for the platform on which it exists for several reasons, the worst of which being that it has no home button. There is no way to get to the home screen of the tablet other than exiting all of your open apps. There is a system-wide search function and app manager, but neither can stand in for the lack of a basic feature. Pinning anything to the home screen seems like a non sequitur, and there appear to be no touch functions for easy access to system settings, much less multi-touch gestures. Simply put, even with Google Play Store support, Chrome OS works best on a tablet with a keyboard. Unfortunately, we were not able to test the augmented reality function of the tablet during Acer’s big event. Acer’s – and the world’s – first Chrome OS tablet might be ideal in a classroom environment for security reasons, but it’s certainly not ideal in most other applications. The tablet employs a gorgeous display and gets extra points for the included stylus, but we’d have a hard time using this tablet with any regularity considering these shortcomings. While we’ve yet to fully test the Chromebook Tab 10, we’re sad to say that we’re not all that excited to do so anyway.